Cyber-Hobby is pleased to announce the comeback of its fabulous Orange Box series, especially as modelers under current economic constraints all around the globe seek better value for their money than ever before. 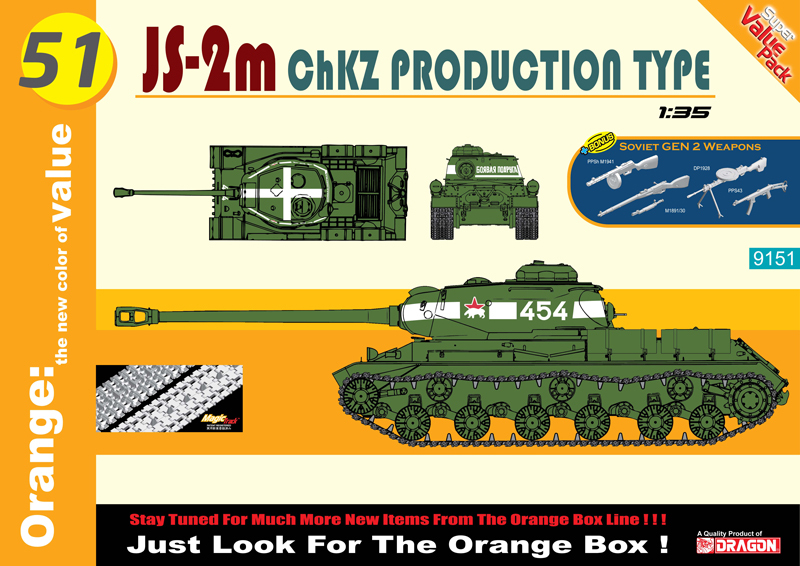 It has been a while since the last kit, but Orange Box is back with a bang in the form of this popular 1/35 scale kit of a Soviet JS-2m. It will be up-graded with Magic Tracks as well. The second half of this Orange Box set is a fine 1/35 scale assortment of Soviet Gen2 weapons from Dragon. Weapons include the famous PPSh M1941 and PPS43 submachine guns, Mosin-Nagant M1891/30 rifle and DP1928 machine gun. These mainstay weapons of the Red Army were widely used in WWII, and so they make a fine complement to the tank itself. As it says on the box top of this exciting combo, “Orange: The new color of value”! Cyber-Hobby is thus proud of its comeback kit of the year!